BELGIUM: Alstom's 6MW turbine is just a few days away from being fully installed at the 165MW Belwind ll wind project, 45km off the Belgian coast. 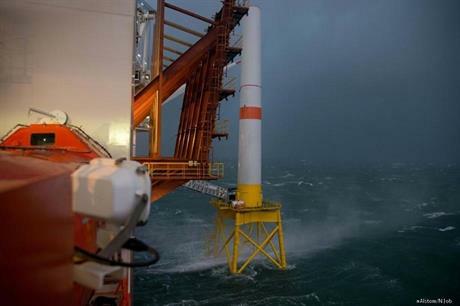 The jacket and tower of Alstom’s Haliade 150 offshore turbine have been installed. Two blades have already been attached to the nacelle, which Alstom called the ‘bunny’, and together with the third blade are onboard the Bold Tern vessel near Belwind II. A spokesperson for Alstom said: "We are trying to install the machine offshore but due to the weather conditions we have stopped. "I hope in the next week the bunny and blade will be installed. We expect, weather permitting, to get electricity from the turbine in November." Alstom is organising a ceremony for the installation of its prototype turbine, which will be installed at Belwind II together with 55 of Vestas V90 3MW turbines. This marks another milestone in the development of the next-generation of offshore turbines. Dong Energy's 12MW Gunfleet Sands 3 demonstration project, which was inaugurated in September, has a pair of Siemens 6MW turbines that will be testing over the next three years.